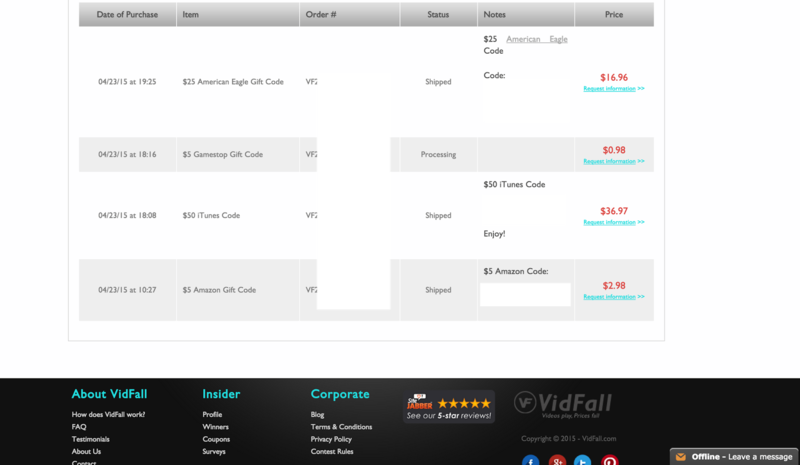 iP3: VIdFall A All New Deals Site! Unlike penny auction sites VidFall.com there is no cost or expense to earn the deal, unless you mind watching a few videos to lower the price of a item. Promo Code and bonus below, sign up and use the code below. VidFall is a new type of deals site, unlike penny auction sites where you have to pre purchase bids and there are no guarantees that you will win the auction you are bidding on, typically losing your bids(on average around $0.60 per bid on most penny auction sites). VidFall has no bids and nothing to pay for, unless you're quick enough to hit the Buy Now button. One of the main things I like about VidFall is that you choose when the deal is just right, unlike a penny auction site its till the last bid. There are a few steps you can take to make it a bit more fun and get a deal on a item. 1. Find an item on Vidfall that you would have purchased as full price otherwise i.e. ( Apple Tv, a gift card to a store you shot at already, etc) and stay on its page and watch the videos and the price fall. 2.Take a look at the past winners and from there you can get a rough idea of where a certain item hits that sweet spot and sells, and then you try and last it out. 3. Know when it a item you are looking at is worth the price for you( its your choice to buy the item, so pick a price and get as close to it as possible. 4. Make sure you connect a payment source and had have Express Checkout active, you don't want someone with express checkout to beat you to the punch while you are inputting your payment info. 5. Have fun, take your time, there are plenty of items reposting at a later time, if you didn't get it this time check the site a bit later or the next day. Once you have a strategy and are ready to make an account, use my link here: www.vidfall.com/n/P6GSZGTKIY and we will both get 50k rewards ($5 discount power) when you make your first VidFall purchase, and use this Bonus Promo Code for our readers: fivemore and you will receive 5% off your purchase(one time use only). These are some of my first deals and now I'm hooked. A team dedicated to making shopping affordable for the masses, VidFall is an daily deals website for goods, services, and travel, where prices fall because users are watching sponsored videos. Each time a user watches a video advertisement on our website, we take the money advertisers pay us to show that video and apply it towards discounting a retail item. Thus, decreasing the price you would pay if you wanted to buy it. But you aren't on VidFall alone. In fact, a whole group of users are simultaneously watching videos with you, generating a huge discount. At VidFall, you are working together and competing with one another all at the same time. Because the more users online watching videos, the faster prices fall. However, the first person who decides to buy now, gets the entire group discount. That’s huge savings. VidFall offers a wide variety of items, from phones to gift cards to luxurious vacations. We even feature charity deals, which apply the revenue users generate from watching video ads towards great causes around the world. Thanks for your interest in VidFall. Founded in September 2013, VidFall is a portfolio company of Wasabi Ventures, LLC.